This piece was originally posted under the title ‘A Benedictine bookplate designer’ on the Cambridge University Library European Languages blog. The original post can be seen here. Many thanks to the librarians at CUL for kindly allowing us to repost this on the ACLAIIR blog. The origins of the European exlibris or bookplate lie in the woodblock prints of fifteenth-century Germany, while the first known British bookplate records the gift of books by Sir Nicholas Bacon to Cambridge University Library in 1574. The Library’s collections contain many thousands of diverse examples, intended as a record of ownership but ideally also a sign of the personality and tastes of the user and the artistic abilities of the designer and printer. Sadly a very small proportion of the Library’s holdings are recorded on Newton and a few thousand only on a card index kept in the Rare Books Room. When I was a child, Esplugues, my home town, was agricultural. The seasons of the year displayed themselves in all magnificence. The fields, vineyards, olive trees, wheat, poppies … The robins and swallows … The trees stripped bare and then dressed themselves again. Everything made my heart pounce … my bookplate prints remind me of all this. Father Oriol entered the Benedictine community as a novice on July 3rd 1956, and given his great aptitude for drawing, he was enrolled at the Conservatorio de las Artes del Libro, where he learnt the art of engraving under Antoni Ollé Pinell. He travelled extensively in Europe in 1969 and 1970, and during this period established many contacts with artists and collectors of bookplates. 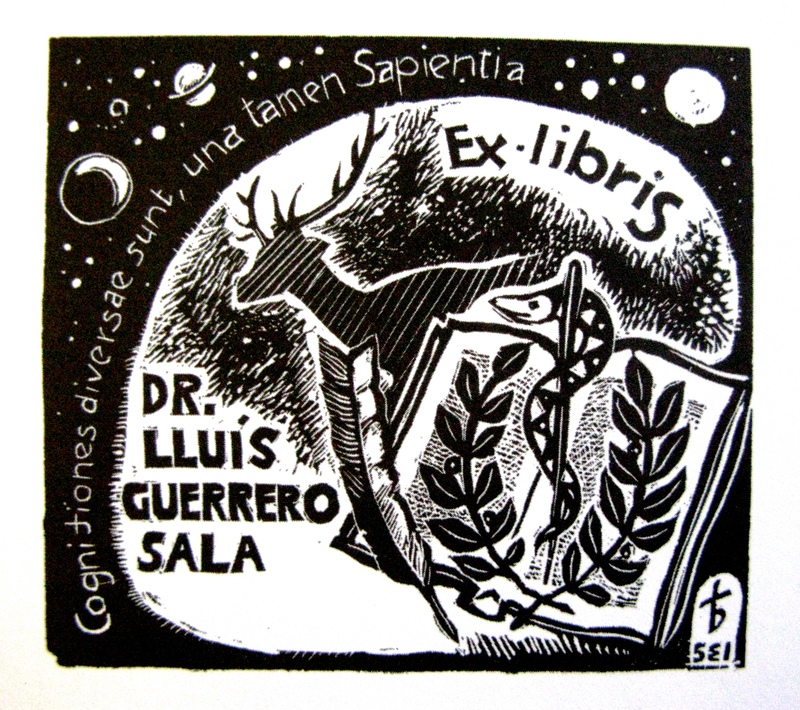 This volume gathers together and reproduces chronologically some 572 bookplates made by Father Oriol between 1960 and 2011, 499 of them being woodcuts from boxwood. 25 bookplates printed from the original wooden blocks are also inserted. 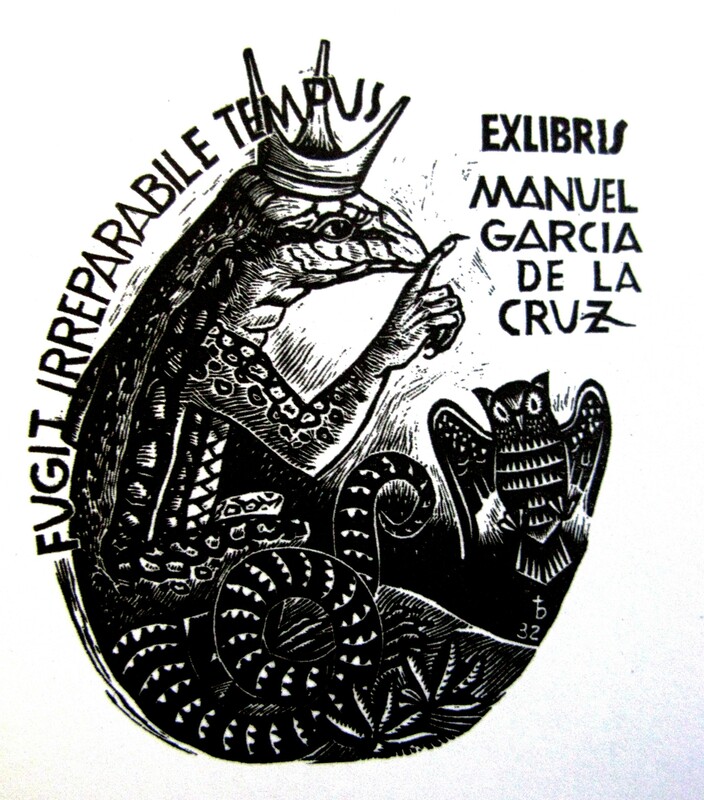 In addition there are three short introductory essays – one on Father Oriol, another on the art of the bookplate and a third on xylography – in Catalan with translations in Spanish, English, German and Italian. This entry was posted in 20th century, exlibris, visual media on 27/07/2015 by ACLAIIR.